New York Times - An attack on a political rally killed the Pakistani opposition leader Benazir Bhutto near the capital, Islamabad, Thursday. Witnesses said Ms. Bhutto was fired upon before the blast, and an official from her party said Ms. Bhutto was further injured by the explosion, which was apparently caused by a suicide attacker. At least a dozen more people were killed. “At 6:16 p.m. she expired,” said Wasif Ali Khan, a member of Ms. Bhutto’s party who was at Rawalpindi General Hospital where she was taken after the attack, according to The Associated Press. A tribute to Capt. Travis Patriquin and the men and women who fought alongside him in Iraq. His is one of the greatest, simplest explanations of the situation in Anbar. More at Michelle Malkin's site. The pro-global warming cultists enjoy a huge money advantage. Paleoclimate scientist Bob Carter, who has testified before the Senate Environment and Public Works committee, noted in an EPW report how much money has been spent researching and promoting climate fears and so-called solutions: "In one of the more expensive ironies of history, the expenditure of more than $50 billion on research into global warming since 1990 has failed to demonstrate any human-caused climate trend, let alone a dangerous one," he wrote on June 18, 2007. The $19 million spent on research that debunks the global warming faith pales in comparison. Might be considered lopsided by a fair observer. And so what did the Goracle do when confronted by 400+ scientists who say he is nuts? He projects the response that a few of the 400+ took money from Exxon-Mobil -- Which Exxon-Mobil says is not true. Typical liberal projection of evil motives to others, to try and draw the scientific hounds off the chase. Science belongs to no political party, especially the socialists -- Science is science and will not stand to be politicized. Sorry oh holy Goracle, but there are a whole lot of people out there that are not as dumb as you need them to be to pull off your hoax. "But global warming is a popular hypothesis, Dr. Kennedy. It's not established. You remember the difference." And talk about follow the money, do these folks think everyone is ignorant? Grants work as political pay-off, just the same as citing tainted Exxon-Mobile grant money does. What do you think the grantee wants in return -- Simple, political science which supports the hypothesis that the grant is aimed to support. It's a vicious circle. More here. GLOBAL WARMING from made made CO2 is a HYPOTHESIS, it is not an established fact. In fact, what fact there is regarding CO2 forced global warming tends to support the notion that it is not true. There is another popular notion out there, that being everybody should drive a 'Prius' or some similar hybrid vehicle. The Prius gets better fuel mileage, does more damage to the Earth's resources. Yes, that's right, more. Conveniently forgotten in all the hoopla about fuel mileage, we forget about manufacturing damage, what it costs in total to build one of these hybrids. Unless of course the Democrap Congress mandates you buy one, then what are you going to do? Hey I have an idea, why not drill in ANWR and in the other 85% off limits areas of the US coast. There are huge amounts of untapped oil out there, if we can get rid of the socialists in congress who have now seized on the stupid notion of man caused global warming as the reason for submitting to tyranny. I would venture a guess that the entire life cycle cost to resources, from the start of manufacturing to the end of life burial of these cars for idiots would be in favor of current technology. It takes energy to move mass, and one of the few ways to get better fuel mileage is reduce weight. For about every 10% reduction in weight you gain about 6% in fuel mileage. The other way to do it is to improve efficiency. Notice that these hybrids do not achieve the 35 mpg mandated by the Democrap Congress. Did comets help create Earth's seas? For years scientists thought comets slamming against the newborn Earth helped deliver water to a once dry planet. But roughly a decade ago this view was shaken by the discovery that the water in comets and Earth's oceans did not match up in terms of hydrogen isotopes. Calculations then showed it was highly improbable that enough icy rocks from the suspected homes of comets — the Kuiper belt past Neptune and the Oort cloud past that — could have collided with Earth to supply its oceans. In the last two years, however, researchers have discovered comets in the outer part of the asteroid belt. These "main-belt comets" may have the right levels of hydrogen isotopes, and are perhaps close enough to Earth to have realistically brought us the seas that life emerged from. "No one knows for certain yet where Earth's oceans came from," said University of Hawaii astrophysicist David Jewitt. "Earth's oceans are likely a mixture of water from all sorts of places, but the main-belt comets are very likely one of them." The suspected homes of comets include the Oort cloud, the Kuiper belt and now the asteroid belt. But are there more reservoirs of comets yet to be found? The Oort cloud is a theoretical cloud of icy rocks roughly 4.6 trillion miles (7.5 trillion kilometers) from the sun thought to be the source of long-period comets — that is, ones that take more than a few centuries to complete their orbits. It was once thought the original home of short-period comets as well, until calculations suggested that was impossible. About 20 years ago, the Kuiper belt roughly 4.6 billion miles (7.5 billion kilometers) from the sun was then proposed to be the home of short-period comets. "But measurements taken in the last few years raise some doubts about that," Jewitt explained. "Maybe there are other reservoirs of comets yet to be discovered." Secrets regarding the birth of the solar system? Comets were long thought to be primordial relics, pristine leftovers from the protoplanetary disk that once surrounded the newborn sun. As such, it was supposed they might hold secrets untouched for billions of years regarding the birth of our solar system. Increasingly, however, it looks as if the comets we see are anything but unspoiled. Instead, "there is good evidence that many of them are nearly burned-out hulks, with neither the size, mass, shape nor spin they might have had before entering the solar system," Jewitt said. Still, "since comets are icy, they're not entirely cooked, and we may learn a lot regarding the formation of the solar system from chemicals trapped in their ice," he added. Comets so close to the sun? The main-belt comets are themselves a mystery. Until their discovery, researchers had largely supposed no comets could have lasted that close to the sun without getting baked away after a few centuries or millennia. Dirt coatings on main-belt comets could have protected them from sunlight for billions of years. Every now and again boulders a yard or larger tumbling around the asteroid belt might hit these comets, uncovering their ice and triggering the plumes of gas and dust that got them discovered in the first place. "We expect to soon find many hundreds or thousands of main-belt comets," Jewitt said. As our solar system formed, calculations predict the gravitational pull of the planets would have scattered 90 to 99 percent of all comets that once orbited the sun away toward the stars, never to be seen again. "If every star does that, you would expect some of their comets to come toward us, but no such object has ever been seen," Jewitt said. Still, as astronomical telescopes and techniques improve, Jewitt remains optimistic that such interstellar comets will be detected fairly soon. These comets would prove quite distinctive, zipping at great speeds and following trajectories completely unlike the orbits our comets follow. "We could see interstellar comets for the first time in the next few years," Jewitt predicted. "It would be great if we saw one, especially so if we had the wherewithal to launch a mission to one, to get samples and study the diversity of comets in an interstellar and galactic context. But we have to find one first." The best of the best, no socialist Santa message in this ad. 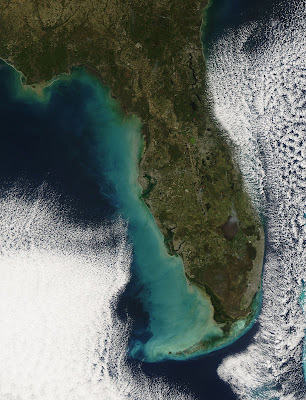 Sediment and bright green phytoplankton color the waters on the shore of the state of Florida. This image was captured by the MODIS on the Aqua satellite on December 17, 2007. Phytoplankton are tiny marine organisms that, much like their land-based plant relatives, use sunlight to convert water and carbon dioxide into food. There are several fires on the image, marked with red dots. One, near Lake Okeechobee (the nearly round dark patch insouthern central Florida), has a smoke plume rising from it. Senate Report Debunks IPCC "Consensus" which now consists of seven scientists who support the notion that man causes global warming by exhaling. Astonishing, what Gen David Petraeus and the American troops have done. An astonishing turnaround occurred in the Senate on Tuesday: 70 senators voted to fund the Iraq war with a fresh $70 billion and no strings attached. Think about this a moment. Last winter, after Democrats captured the Senate and House, it seemed likely they'd succeed in limiting or ending the Iraq war, probably by setting a firm timetable for withdrawal of American troops. After all, both President Bush and the war itself were highly unpopular. The Democratic triumph in the election made that clear, even to those who doubted opinion polls. 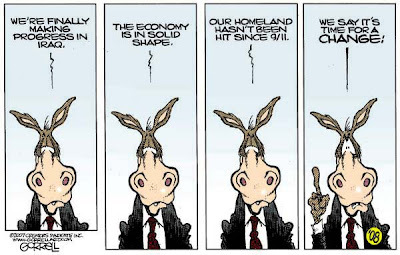 And Democrats made the anti-Iraq crusade their top priority in the new Congress. Now, the 70-vote approval of the war by the Senate represents the breathtaking dimension of their failure. "The Man Of The Year". Bush was ready to sign the bill, assuming the war funding clears the House on Wednesday. Democrats again failed to win votes to force removal of U.S. troops or set a nonbinding target to remove most troops by the end of next year. Nice work, Mr. Reid -- Bet you can't wait for that next Netroots teleconference? U.S. Rep. Joe Donnelly returned from a second trip to Iraq in five months encouraged that the mission there is going better and that by 2009 the U.S. military's role could be primarily as trainers and advisers. "I feel we've made progress, and the other part is I feel we can see an end game in sight," Donnelly, D-Ind., told reporters on a conference call Tuesday from Washington. "It isn't we just keep plugging away in the hopes something will turn out right. Gen. (David) Petraeus is working a plan and we seem to be heading toward a place where the Iraqis can be self-sustaining and we'll have a smaller presence in the background." Donnelly's findings were in stark contrast to his visit to Iraq last July, when he said the only positive thing that happened in that country since the beginning of the war in March 2003 was the ouster of Saddam Hussein. I am concerned about the inevitable backlash against science and scientists, when the public learns the correct information about climate change. Summarized as "stop spreading lies". The science community is beginning to get a bad name. WHEN TERRORISTS GET TO THE AFTERLIFE, THEY'LL FIND THAT NONE OF THEIR 72 WOMEN ARE STILL VIRGINS. In his own words, what makes a Liberal go stark raving mad. We all know that in the past when the Liberal pushed them down the memory hole, the drive by media kept them there. Times change, so here they are again. No not the part about making the Goracle rich, that's already been done and continues today. But the real agenda, it's right out in the open now for all to see. All the sound and fury, all the relentless barrage of media hype, all of the wailing and gnashing of teeth from the true believers and sycophants of Al Gore about global warming have been orchestrated for a specific purpose. That purpose was out in the open, in all its global socialistic majesty in the luxurious setting of the UN conference on global warming in Bali beach. Notice the setting chosen by the chosen to conclude their socialist tax agenda. It is about global taxation, with the United Nations as the recipient of the massive windfall of money taken from the “rich” nations. And all their little NGOs standing around with their hands out, to help the poor, of course. Global Carbon Tax Urged at UN Climate Conference. So now you know, I knew they would tell what is really going on, an elaborate scheme to separate the rich countries and their money. Climate, global warming, you are supposed to FEEL good about all the money you have given to 'help the planet'. How all this works, this help, that's a secret. The good old leftists Democrats, they want game, they are all for it, hand over the money, submit, or else. Oops, does that sound a lot like what the terrorists want? The Goracle is out of touch with reality, nothing new there -- The original uni bomber manifesto, Earth in a Lurch is responsible for misleading folks badly with his fair tale. 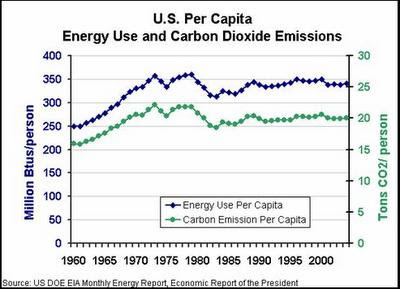 While CO2 emission from China and India sky-rocket, the USA CO2 emissions are actually stable, or decreasing. Much better than say EU, which is climbing. Why didn't the Goracle do anything when he was in the VP job and could have 'made a difference'. Simple, they tried and got shot down. It's much easier to demagogue Bush than it was to lead. Leadership requires a degree of truth, which Democrats sadly lack. So how is the negotiations at Bali beach going? German Environment Minister Sigmar Gabriel is promoting a plan to cut emissions blamed for global warming by 40 percent at this week's climate talks in Bali, Indonesia. At home, RWE AG is building three power plants fired by coal, the fuel that produces the most greenhouse gases. While Germany proposes to reduce carbon-dioxide emissions by encouraging the use of renewable energy such as biofuels and windfarms, more than half the new power stations planned for Germany will be fueled by coal, according to Essen-based RWE, the nation's second-biggest utility. Power companies are choosing coal, which produces twice as much carbon-dioxide as natural gas, over cleaner fuels because world leaders have failed to agree on a strategy for reducing emissions. Without incentives to build less-polluting plants, utilities are guessing about which fuels will be most profitable and delaying investments until an agreement is reached. With liberals it always is about meaning well, not actually doing anything. Pay particular attention to who raised there hands before the leader spoke up. Tells you all you need to know about the entire field in one short minute. Everyone else is just a panderer. Pollution and CO2 not the same. CO2 is needed for plants to grow, pollution makes you cough. Merging the two severs the enviro-whackos purpose, so you often hear them interchanged. CO2 is a MINOR greenhouse gas. No one wants to breath polluted air. One satellite image makes clear what is wrong with excluding developing countries from any limits on pollution or greenhouse gases. It also makes clear why technology is the only answer man has. Haze hugged the southern slopes of the Himalaya on December 10, 2007. The MODIS on NASA's Terra satellite took this picture the same day. 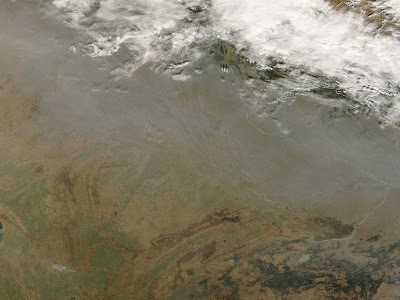 This image shows the region around Kanpur, India, with dingy gray haze blanketing the area. Multiple factors can contribute to haze near the Himalaya in late fall and early winter. Black lines show country borders - Kanpur, India's border with Nepal runs right along the haze. Nepal is the strip covered with clouds in the top right-hand corner of the image. The current President, George W. Bush, has indicated that he does not intend to submit the treaty for ratification, not because he does not support the Kyoto principles, but because of the exemption granted to China (the world's second largest emitter of carbon dioxide). . . . Despite its refusal to submit the protocol to Congress for ratification, the Bush Administration has taken some actions towards mitigation of climate change. Even though the media is illiterate when it comes to the Internet, there is no reason for you to be. The news, as usual, gets it all wrong -- I assume they want it that way, propaganda instead of news. Maybe that's why the news business is dropping faster than a dead cat which has used up all it's nine lives. As the Bali climate-change jamboree and carnival draws to a close, the barkers are still barking, but the world will go on, without any new global socialism, ethical and moral obligations cast aside. The pompous high minded speeches and WARNINGS are going off like a finale at a fireworks show. But in the end, nothing looks like it will come out of all the wasted greenhouse gas. It's a good thing. Larry Bourbonnais, a combat-tested Vietnam veteran, said it was the bravest thing he's ever seen. Bourbonnais, who was among those shot by a gunman Sunday at New Life Church, watched as a security guard, a woman later identified as Jeanne Assam, calmly returned fire and killed the shooter. Bourbonnais, 59, had just finished up a hamburger in the cafeteria on the sprawling church campus when he heard gunfire, he recalled. He headed in the direction of the shots as frightened people ran past him looking to escape to safety. "Where's the shooter? Where's the shooter?" Bourbonnais kept yelling, he recalled. Bourbonnais yelled at the gunman to draw his attention, he said. "First, I called him 'Coward' then I called him 'S---head' " Bourbonnais said. "I probably shouldn't have been saying that in church." That's when the shooter pointed one of his guns at Bourbonnais and fired, he said. Bourbonnais ducked behind a hollow, decorative pillar and was hit in the arm by a bullet and fragments of the pillar. At about that moment, Assam, 42, turned a corner with a drawn handgun, walked toward the gunman and yelled "Surrender!" Bourbonnais said. After the gunman went down, Bourbonnais asked the Assam, a volunteer security guard with the church, how she remained so calm and focused. "I was asking the Holy Spirit to guide me the entire time." Early snows, late srpings, missing hurricanes, missed forecast like 2007 warmest year on record(nope didn't happen), all caused by global warming. A string of storms brought the season's first snow to the eastern United States from the mid-Atlantic states to New England during the first week of December 2007. 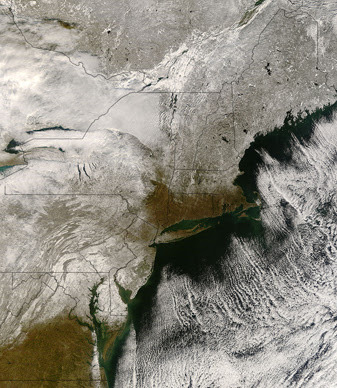 By December 6, most of the clouds had cleared, providing the MODIS on NASA's Terra satellite this view of the snow-covered landscape. The snow highlights the contours of the land. Waves and curves follow the gentle folds of the Appalachian Mountains through Virginia, West Virginia, Maryland, and Pennsylvania. The more rugged mountains of New Hampshire, Vermont, and New York wrinkle the surface of the land. Dr David Whitehouse, an astronomer and the author of ‘The Sun: A Biography’ writes in Science & Tech" target="_blank">The Independent today that we might be about to enter a period of unusually low sun activity. Such periods, in the past, have been associated with low temperatures on planet Earth. Some members of the Russian Academy of Sciences, Whitehouse writes, say we may be at the start of a period like that seen between 1790 and 1820, a minor decline in solar activity called the Dalton Minimum. They estimate that the Sun’s reduced activity may cause a global temperature drop of 1.5C by 2020. This is larger than most sensible predictions of man-made global warming over this period. This is something we must take seriously, Whitehouse adds. What happened in the 17th century is bound to happen again some time. 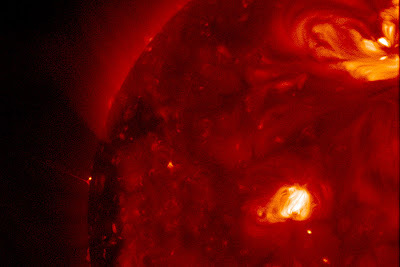 Recent work studying the periods when our Sun loses its sunspots, along with data on other Sun-like stars that may be behaving in the same way, suggests that our Sun may spend between 10 and 25 per cent of the time in this state. He moots that the lateness of the expected cycle of sunspots might even be the start of another Little Ice Age. If so, then our Sun might come to our rescue over climate change, mitigating mankind’s influence and allowing us more time to act. It might even be the case that the Earth’s response to low solar activity will overturn many of our assumptions about man’s influence on climate change. We don’t know. We must keep watching the sun. I wonder if they are watching in Brussels. With all the indignant huffing and puffing about the lost CIA tapes, today's Washington Post comes up with this goodie. What to make of this? For Starters Rep Pelosi knew of waterboarding in 2002, and according to people who were there raised no qualms with the process, and other methods. Looks like everyone got the briefing who had "a need to know". Tough enough? For whom" We have a right to know who asked the questions, who attend the meetings. Congressional leaders from both parties would later seize on waterboarding as a symbol of the worst excesses of the Bush administration's counterterrorism effort. The CIA last week admitted that videotape of an interrogation of one of the waterboarded detainees was destroyed in 2005 against the advice of Justice Department and White House officials, provoking allegations that its actions were illegal and the destruction was a coverup. Yet long before "waterboarding" entered the public discourse, the CIA gave key legislative overseers about 30 private briefings, some of which included descriptions of that technique and other harsh interrogation methods, according to interviews with multiple U.S. officials with firsthand knowledge. I can't help but draw connections to the way the mythical agent Plame case was handled by the media -- All along everyone knew the investigation was for naught, and the result was an innocent person was subject to trial, spent lots of money and sentenced to jail for faulty memory. Next time use the tried and tested "I do not recall" defense honed to excellence by Hillary Matters. I guess we know why impeachment is "off the table". When an old hippie writes and energy bill, you get what the House produced this last week. Hall of Record has the details. We don't need any old 60s hippies trying to tell us how to live our lives. This creaky old Democrat leadership crew lavishly slap on the botox, stretch and pull, laser peel and sand, to try and make themselves look young, hip, vibrant -- You should be aware that that is a hard job when you are over the social security retirement age. Nancy Pelosi was born March 26, 1940, which makes her 67 going on 20. Senator Boxer was born November 11, 1940, who now chairs the Senate Energy committee, trying to look 17 again. Just two old 67 year old hippies looking for their last fling. Sen Harry Ried was born December 2, 1939, the oldest and some say most intellectually challenged of the whole bananas bunch. Fine choice of leaders, old hippies, retreads whose former glory was protesting a war, forcing a defeat of America, and getting rid of Nixon. What a set of accomplishments. Times change, and the old hippie ways don't work anymore. Might as well give it up while you can. David Archibald can be seen and heard on YouTube talking about his 4 Part paper “Past & Future Climate change”. Given the current status of solar cycle 24, this set of lecture videos is a good refresher course of what might be happening right now. People are watching, and it's not pretty. Not very environmentally sound either. Government officials and activists flying to Bali, Indonesia, for the United Nations meeting on climate change will cause as much pollution as 20,000 cars in a year. The delegates each will produce an average 4.07 metric tons of carbon dioxide, or CO2, to reach the resort island 950 kilometers (600 miles) from Jakarta, according to estimates e-mailed to Bloomberg by the UN agency holding the conference. I will believe it's a 'crisis' when the people running around with their hair on fire telling me that I have to cut energy usage, begin setting the example -- They flock to far away places to bask at luxury resorts for a week. I guess no one thought about video conferencing instead of laying on tropical beaches. Of course, they are using carbon offsets, those tree planting scams, to make them all feel good. So I have an idea, why not everyone plant trees for themselves and put the middle man out of business. BTW, the NGO with the biggest footprint at the conference is, you guessed it, a carbon offset company, looking to see how to drum up business with the scam. When you consider it's all a hoax, a scam to rid you of the burden of your money, what better way to get to the beach than on someone else's nickel. If you want to know more how the hysteria works, read this WSJ article about "availability bias". I have run my own survey about what people actually know about what they claim to know, and it turns out they know nothing. It's a form of the fine art of availability of information, fact based or not -- They learned what they profess to know from what others said about the subject. In general the root goes back to what someone said on TV, the highest standard for the populists "as seen on TV" -- As if that makes any real difference except someone had the money to put it on TV. If you want to run your own test, ask the simple question about global warming "how do you know"? End it with "I wonder why no one ever talks about the sun?" The reason this all works is that the average person is woefully ignorant of all aspects of science and it's methods. The lure of easy money sure attracts a crowd. NUCLEAR winter, mega-famines, global cooling, acid rain, bird flu, death by fluoride, Chernobyl. I've seen it all and nothing scares me now. I can't remember exactly what I wrote that was so evil. So much to choose from. Was it that I refused to be freaked by this latest panic attack that global warming was blasting in and . . . Oh, God, WE'RE ALL GOING TO DIE! Or was it that I wouldn't listen to that frenzy of activists insisting the genetically modified canola oil I use to fry my chops would nuke us all into an explosion of pustulating tumours? Anyway, one young reader was furious that I'd yet again stood snobbily apart, while his mob ululated warnings of some fresh horror. "You'd be on your own," he sneered in an angry email. True enough, my young critic, I do often feel lonely in this astonishing age when to panic is a sign of virtue and to reason a sign of a cold heart. The Telegraph has an interesting article with the charge being leveled by a Swedish scientist: The IPCC falsified data showing a sea level rise from 1992-2002 according to Dr. Nils-Axel Morner, former head of the Paleogeophysics and Geodynamics department at Stockholm University in Sweden. The IPCC falsified data showing a sea level rise from 1992-2002 according to Dr. Nils-Axel Mörner, former head of the Paleogeophysics and Geodynamics department at Stockholm University in Sweden. In an interview by George Murphy, Mörner cites various examples of falsification of evidence claiming sea level rises. "Then, in 2003, the same data set, which in their [IPCC's] publications, in their website, was a straight line - suddenly it changed, and showed a very strong line of uplift, 2.3 mm per year, the same as from the tide gauge. And that didn't look so nice. It looked as though they had recorded something; but they hadn't recorded anything. It was the original one which they had suddenly twisted up, because they entered a 'correction factor,' which they took from the tide gauge" in an area of Hong Kong that had been subsiding, or sinking. Mörner says that the claim that salt water invasion of a fresh water aquifer indicated a sea level rise ignores the more likely cause due to draining the aquifer for the pineapple industry. My advice from the past remains current, be very skeptical and require a very high level of proof, not conjecture, before agreeing to open your wallet. Currently the proof is that satellite data cannot find the vaunted signature of CO2 warming in the atmosphere. Conclusion, CO2 caused glow-bull warming is a myth. Read the summary paper at the link if you don't want to wade through the complete paper. Mörner is particularly critical of the overemphasis on computer modeling by IPCC "experts" instead of doing actual field research like geologists do.
" Again, it was a computer issue. This is the typical thing: The metereological community works with computers, simple computers. Geologists don't do that! We go out in the field and observe, and then we can try to make a model with computerization; but it's not the first thing." The various computer models are not based on empirical data, they are based on nothing but conjecture and guesstimates. You cannot find fact when there is none. But you can verify that the CO2 signature is in the atmosphere today, since the IPCC says that the atmosphere has already warmed due to it's presence. But when you take the measurements, you come up empty handed, it simply is not there according to the scientists. Yesterday, the Senate committee chaired by that daunting beauty of an old lady Sen Botoxer, passed out of committee a brand new tax bill that includes $100s of billions of dollars in new taxes for transfer to the loons. It's called cap and trade, an AL Gore original get rich quick scheme for the alarmists. 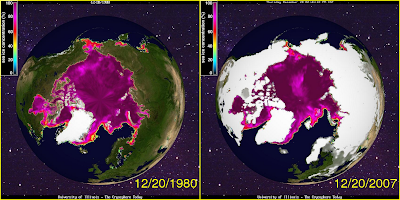 So if you think this whole glow-bull warming isn't a problem, think again. You will pay, and pay and pay for that lapse. BTW, the reason you are seeing former researchers coming out, is the glow-bull warming hoaxers use grant money to keep the skeptics at bay. If you don't buy into the glow-warming bull-oney, you don't get any grant money. Cute isn't it? Stalin did the same thing with scientists in the old Soviet Union. We need answers, simple straight answers., not cap and trade hogwash. One year ago, when they took control of Congress, House Democrats made many promises. Most of all, Democrats promised you that they were ready to govern - over the past year it has become all too clear that they have let you down. Take a moment to watch our latest web video, which highlights the performance of House Democrats over the past year. With an 11 percent approval rating, the lowest in recorded history, it's no wonder that Speaker Pelosi recently remarked, "I know that Congress has low approval ratings, I don't approve of Congress, because we haven't done anything." Taxes, taxes and more taxes, all leading to socialism. Who knew this it what the Democrats meant when they said they were ready to govern. You sure didn't expect them to put this in their plan for election, now did you? Why, they are socialists at best, communist at worst, they never tell the truth about anything. Madame Chairman, thank you for hosting today’s markup of the Lieberman-Warner Climate Security Act of 2007. This chart here is a diagram of the bill’s requirements, new agencies and new programs. The first thing one notices is how extremely complicated and far-reaching this proposal is. Rube Goldberg would be proud, as several members will focus upon. I want to focus upon the red blocks at the top. Unfortunately, they are not just blocks - they represent millions of families, farmers, drivers and workers who will pay higher heating bills, suffer more pain at the pump, and lose more jobs because of this bill. The bill’s sponsors themselves admit this bill will cost our families and workers hundreds of billions of dollars. Where will that money go? 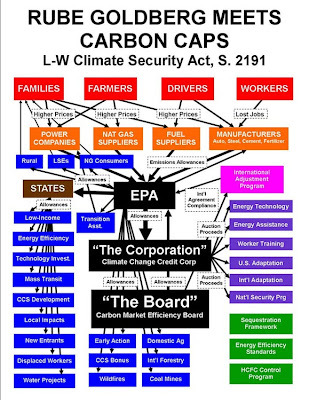 It will flow out of the pockets of our families, farmers, drivers and workers at the top here in red, through those pass thru entities in orange, thru EPA and the new Climate Change Credit Corporation in black and out to all of these new government programs and causes here in blue and purple. Adoption of my amendments will guarantee that these massive new costs do not significantly harm low-income families, farmers, drivers and workers. My amendments will also close loopholes in the international program that leaves U.S. workers at a competitive disadvantage to foreign workers. I also provide for a liability system left out of this bill that is necessary for underground carbon sequestration. I look forward to their debate and adoption. In case you couldn't follow it, here is a handy diagram he includes for clarity. Look a lot like Hillary Care doesn't it? You really expect government to solve anything? And not one drop of new oil in the whole affair. So here's the key question about the Key Judgment of the National Intelligence Council's new National Intelligence Estimate on Iran's nuclear intentions and capabilities: Is this judgement supported by the evidence? This piece written by Herbert E. Meyer served during the Reagan Administration as Special Assistant to the Director of Central Intelligence and Vice Chairman of the National Intelligence Council. In these positions, he managed production of the U.S. National Intelligence Estimates. He is author of How to Analyze Information. Read it all at the American Thinker. Oregon Public Television ran a show that showed a map of the states and whether the State Climatologist was (1) a Skeptic, (2) a Non-skeptic, (3) Both/Neither/Won’t Say (Huh? ), (4) Did not reply, or (5) The office is vacant. But a subsequent discussion in the listserver of the Association of American State Climatologists revealed that few had been contacted and their views were simply “gleaned” from what the producers “thought” their views were. They noted that “many replied that their position was more nuanced--that they believe the Earth is warming as a result of both natural variability and human contributions.” “That was what they meant by ‘both’,” said Delaware State Climatologist Dr. David Legates. “I’m not sure what the ‘neither’ position could have been or why both were grouped with ‘won’t say’. A subsequent discussion in the listserver of the Association of American State Climatologists revealed that few State Climatologists were actually contacted. “The truth of the matter,” said Legates, “is that most ‘skeptics’ believe the Earth is warming as a result of both natural variability and human contributions. As one listed as a ‘skeptic’ by Oregon Public Broadcasting and not contacted for my opinion, I would argue that I should be listed in the ‘Both/Neither/Won’t Say’ category--but by them, the correct response would have been ‘No Reply’ since they never received one from me.” Another very prominent critic of catastrophic manmade global warming, Dr. John Christy of the University of Alabama, is listed as a ‘Both/Neither/Won’t Say,’ and only six were listed as ‘Skeptic.’ “I believe it is journalistic carelessness at best,” said Russell J. Qualls, Idaho State Climatologist, “and intentional deception somewhere on the other end of the spectrum.” Qualls was listed as a “Non-Skeptic” on OPB’s map. See falsified map here. From the article, the key graph ... "Since acrylamide forms naturally in a wide variety of cooked foods, it is not possible to have a healthy balanced diet that avoids it." So now cooking can kill. What to do? Stop reading the newspaper. There it's all better and the 'scientists' can go on to their next grant project. If you want to read more, the article is here. Tim Slagle, a political satirist, offers a funny albeit unflattering viewpoint on scientists in general, and 'political science' in particular. La Niña in all it's glory now dominates the planets weather, and it's showing up as cold everywhere. Sunspot number remains low. Hoping for an upturn soon. Proof positive AGW a hoax. Source ICECAP. Get Dr David Evans summary paper here. Many of those so-called scientists who continue to support the global warming hysteria ignore actual measurements in favor of computer models. The computer models would seem to support their flawed conclusions about global warming while actual, real-world data does not. Satellite data is assumed by most real scientists as the highest quality there is -- The amount of money spent on sensors and recorders dwarfs most budgets. It's also of note that weather balloons and the data they collect substantiates the satellite readings. Nothing cross checks or substantiates the computer models -- GIGO, garbage in, garbage out. Who is buying ... Need equivalent to number of SUVs. And this is just a sneeze, not a real eruption event. 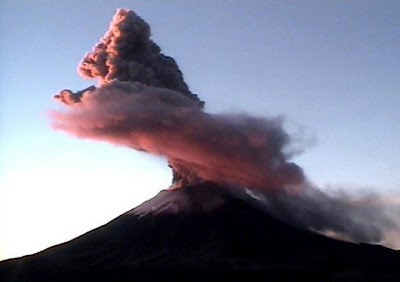 Mexico City - Mexican volcano Popocatepetl on Saturday threw a large cloud of gas and ash into the air about 80 kilometres east of the capital, Mexico City. The cloud reached a height of up to two kilometres over the 5,400- metre mountain, the national disaster protection centre said Saturday. Ash rained down on some areas near the volcano and an area of 12 kilometres around the mountain was blocked off. The volcano has been active for some time, and steam cloud has become an ongoing sight over its peak. H. L. (Henry Louis) Mencken (1880-1956, Baltimore), was a journalist, essayist, magazine editor, satirist, acerbic critic of American life and culture, and a student of the American English. Known as the "Sage of Baltimore," he is regarded as one of the most influential American writers and prose stylists of the first half of the 20th century. Fred took his consistent conservative message to an energetic crowd in Laguna Woods, CA. Curt at Flopping Aces was there and posted video and pictures.